I’m in Paris this week. Maybe I’ll catch a movie here — at the very least, I’d like to see the inside of a Parisian movie theater. But I’m certainly going to miss the press screenings of the three major releases opening this Friday, April 4, all of which I’ve been really looking forward to. Nim’s Island has been on my to-see list for a while not because I’ve read the book upon which it’s based (I’d never even heard of it before), but because I discovered that it’s about a little girl having adventures and rescuing her dad. There simply aren’t enough movies about little girls doing cool stuff, and I really like Abigail Breslin (from Little Miss Sunshine and Definitely, Maybe). 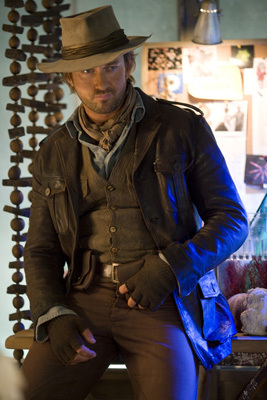 And then I discovered that the dad is played by Gerard Butler in full-on Indiana Jones mode. So, you know: yum. I have read the book upon which The Ruins is based — I first wrote about it, and how absolutely horrific it is, and wondered about the movie it would spawn, back in Summer 2006. Author-screenwriter Scott Smith, who turned his novel A Simple Plan into an even better movie, adapts his own novel again this time, but director Carter Smith doesn’t have much of a track record. So I’m only cautiously hopeful for this one. And of course there’s Leatherheads, George Clooney’s new romantic comedy — he’s starring and directing. Clooney doing screwball comedy in the 1920s is just about irresistible to me.